When he played for the Chicago Bears, Jim McMahon was known as a brash loudmouth diva. 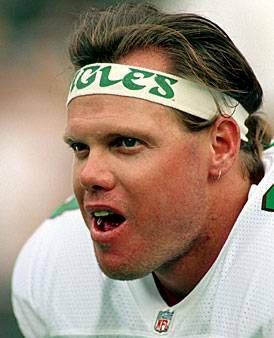 But when he went to the Eagles in 1990, he made almost a complete turnaround. Suffering through a multitude of injuries, he instead got a rep for being tough as nails. And nowhere did he show that grittiness more than just over 20 years ago in a game against the Bill Belichick coached Cleveland Browns. The Eagles, who had lost starting QB Randall Cunningham in the first game of the season, came into the game 4-5, and McMahon had severe elbow problems that rendered him doubtful for the game. McMahon had tried getting a shot of novocaine two days early, on the Friday before the game, but when he overdid it in practice later that day the elbow swelled badly. He couldn’t even bend it. On Sunday morning, a worried Heller awoke and asked McMahon if he could play. “No way,” said McMahon. Heller says McMahon was especially disappointed because he felt he could have picked the Browns apart. “But he was lying there just moaning,” Heller says. “He couldn’t even put up his ponytail!” But by noon that day, after his arm had been massaged for three hours to reduce the swelling around the elbow, McMahon was out on the field throwing spirals. When the Browns, led by Bernie Kosar and a 39-year old rookie coach named Bill Belichick, went up 23-0 early in the 2nd quarter at old Municipal Stadium, it looked like the Eagles were done. But McMahon refused to quit. A touchdown pass to Keith Jackson, followed by a 70 yard strike to Fred Barnett, and the Birds cut the lead to 9. Bernie Kosar then led the Browns down the field, and the Browns tacked on another TD to take an incredible 30-17 lead at the half. The Eagles defense, ranked #1 in the NFL at the time, had been humiliated in the first half. But defensive coordinator Bud Carson made adjustments at halftime, and the D stormed the field in the 2nd half with something to prove. They completely shut down Kosar in the 2nd half, and held Kevin Mack to a mere 23 yards rushing for the game. Roger Ruzek field goals got the Eagles within striking distance, and with 5 minutes left in the game, McMahon hit Calvin Williams with a 5-yard strike. The Eagles took the lead 32-30, and that would be the final score. McMahon, whose elbow had been massaged, drained, salved, and injected with novacaine before the game, threw for 341 yards and 3 TDs in the win. The Eagles, after starting the season 3-5, finished with 7 wins in their last 8 games (the only loss was with McMahon on the sidelines with an injury.) Sadly, that wasn’t enough to make the playoffs. The next year McMahon returned to the bench, then bounced around the league until 1996, when he backed up a young Brett Favre in Green Bay, then retired. The event is set for Friday, June 8th (tomorrow!) from 6-10pm at Victory Beer Hall at Xfinity Live with live music, beer, food and over 20 players from the '93 Phillies team. Shibe Vintage Sports co-owner Johnny Goodtimes speaks with CBS3 about our new Underdog Playoff Shirt. It's a mindset. It's a feel. It'’s simple. It's based on your WHY. It's filled with purpose and intent. It's intimate. It's individual. It's genuine. It's a complete understanding of YOU. It's confidence. It's clarity. It's controlled. It's repeatable. It's natural. Chest/Bust: With your arms at your sides, measure around the fullest part of your chest, across shoulder blades and under arms. Waist: To measure your natural waistline, wrap the tape so it intersects your navel. Keep tape flat, but comfortably loose. Hips: Stand with your heels together and measure the fullest part of your hips. Make sure the measuring tape is level all the way around your body. Inseam: Stand up straight, and start the tape measure high in your crotch. Straighten the tape down the inside of your leg to the bottom of your ankle. Hat Size: Measure your head about a half-inch above your eyebrow where the hat will sit. If you are unsure or between sizes, buy the larger size. If you do not know your size, first determine where on your head you want to wear your hat. Usually it is worn about a half-inch to an inch above the eyebrows and/or just above the ears. Have a friend hold the tape measure (cloth, plastic, or download a printable version here) at the point where you want the hat to rest on your head. Insert the tip of your little finger between the tape and your head. Record the measurement and find your Fitted Hat size using the chart below. This should provide you with a comfortable fit. Neck 14"-14.5" 15"-15.5" 16"-16.5" 17"-17.5" 18"-18.5"
Shoulder 21" 22" 23" 24" 25"
Chest 36"-38" 39"-41" 42"-44" 45"-47" 48"-50"
Waist 28"-30" 31"-33" 34"-36" 37"-39" 40"-42"
Shoulder 14.25" 15.25" 16.25" 17.25"
Bust 32"-34" 35"-36" 37"-38" 39"-42"
Waist 26"-27" 28"-29" 30"-31" 32"-33"